They entertain and uplift your spirit. Both art forms have been performed and acclaimed in major cultural centers around the world. Experiencing them in Bali is the ultimate experience. Most Balinese dances relate to segments of the Ramayana, an ancient Hindu epic illustrating the perpetual struggle between good and evil. A classic dance. Stunning. Depicts the conflict between the good Barong (dressed in a fanciful lion-like costume) and the evil Rangda. Another classic dance. Graceful. Performed by three pre-pubescent girls in colorful attire. Although this frenetic dance was not choreographed until the 1930s (and by a Westerner), the Kecak is convincingly rooted in Balinese tradition. Typically, it features 50 to 100 bare-chested men sitting cross-legged in tight concentric circles. They play the role of monkeys, which is why the dance is sometimes called the "monkey dance". As they sway in unison, they repeatedly chant the nonsensical phrase "kechak ke chak" virtually non-stop and without musical accompaniment. They do this in a hypnotic beat to scare away an evil spirit. 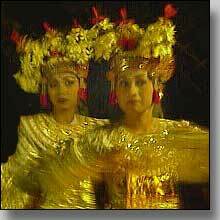 Several Balinese dancers help dramatize the story.